The JWS-50 wire assist hook from Vanfook is a single assist hook designed to battle fish with sharp teeth, such as mackerel. You can use these assist hooks when jigging or on stickbaits and poppers. Fitted with standard wire JH-10 and JH-30 hooks, Vanfook JWS-50 assist hooks have excellent fish-holding strength and superb hooking penetration. The assist line is a strong, flexible and difficult to kink hybrid wire (200lb) which is further protected with a transparent shrink tube. 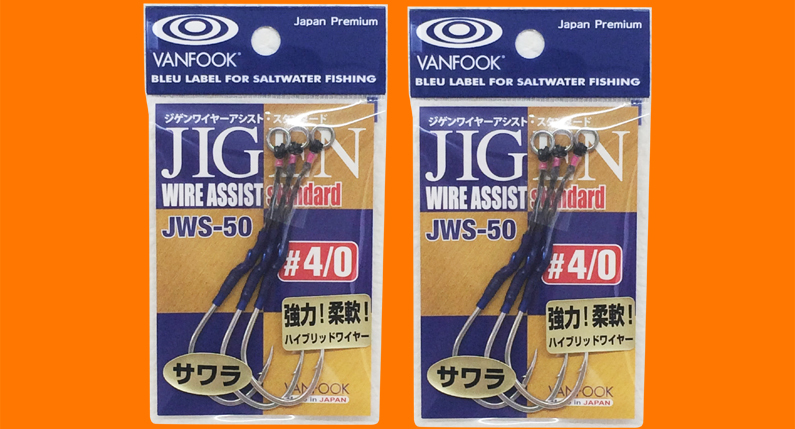 Made in Japan, Vanfook JWS-50 assist hooks are available in sizes 1/0 to 6/0 with three assists per pack. For more information on this and other hooks in the Vanfook range, check out the EJ Todd website. You can also find more info, news and catch photos on the EJ Todd Facebook page.